This Sunday (31 July 2011) I will perform a b2b set with DJ Suranga at Lazy Loungy Sunday. 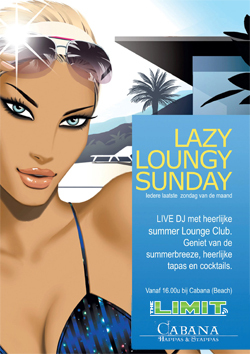 Lazy Loungy Sunday is an exclusive event at "Tapasbar Cabana Hilvarenbeek". DJ Suranga and me will start with a minimal / techhouse set and will likely end with some harder stuff. I'll hope to see you tomorrow!! Be there! Welcome to my brand new website. The past month I've been working very hard to release my new website. With this site I wanna share my productions and give some information about projects I'm working on. At the moment you can read my bio, view fotos of gigs, view movies, download tracks and mixes. With the blog functionality i wanna update my website with information about projects and gigs. Feel free to navigate through my website.